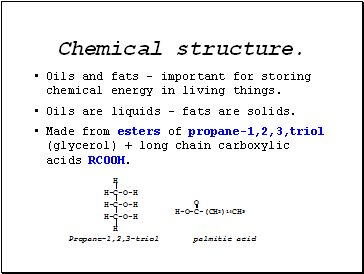 Oils and fats – important for storing chemical energy in living things. 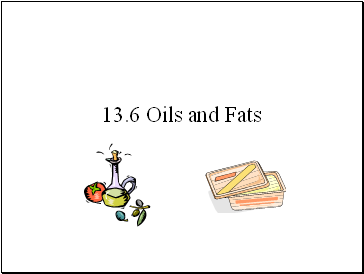 Oils are liquids – fats are solids. Made from esters of propane-1,2,3,triol (glycerol) + long chain carboxylic acids RCOOH. 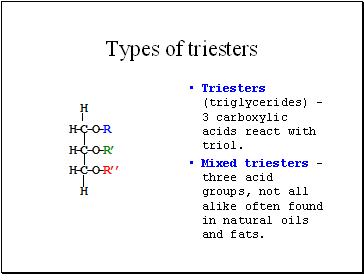 Triesters (triglycerides) – 3 carboxylic acids react with triol. 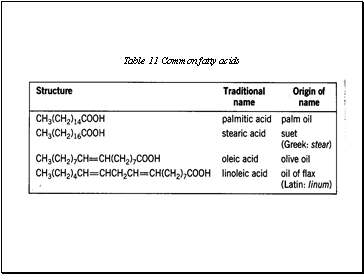 Mixed triesters – three acid groups, not all alike often found in natural oils and fats. 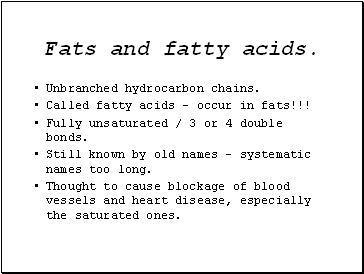 Called fatty acids – occur in fats!!! Fully unsaturated / 3 or 4 double bonds. Still known by old names – systematic names too long. Thought to cause blockage of blood vessels and heart disease, especially the saturated ones. 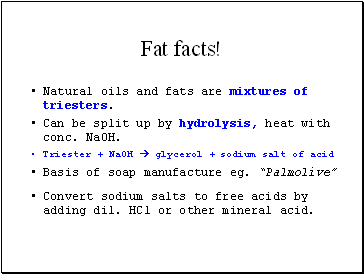 Natural oils and fats are mixtures of triesters. Can be split up by hydrolysis, heat with conc. NaOH. Convert sodium salts to free acids by adding dil. HCl or other mineral acid. Fatty acids present in mixture affect the properties. 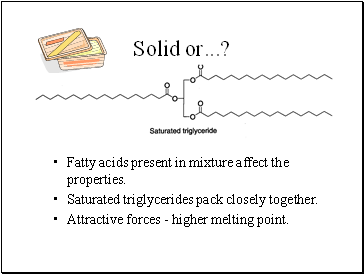 Saturated triglycerides pack closely together. Attractive forces - higher melting point. 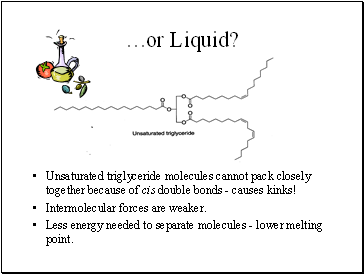 Unsaturated triglyceride molecules cannot pack closely together because of cis double bonds - causes kinks! Less energy needed to separate molecules - lower melting point. Most natural oils need processing to make them fit for use. 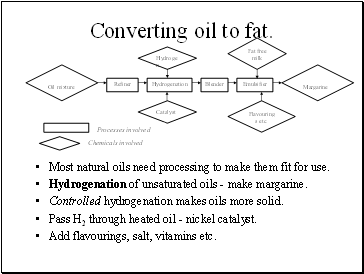 Hydrogenation of unsaturated oils - make margarine. Controlled hydrogenation makes oils more solid. Pass H2 through heated oil - nickel catalyst. Add flavourings, salt, vitamins etc.